Source: Edward Bliss Reed, ed., Christmas Carols Printed in the 16th Century Including Kele's Christmas Carolles Newly Inprynted (Cambridge: Harvard University Press, 1932). One of the oldest sets of printed Christmas carols includes a group printed by Richard Kele in the mid 1500s. His pamphlet was found bound with four other sets or fragments of sets of Christmas carols and poems. These other sets were probably not printed by (or for) Kele, but the group as a whole is referred to as "Kele's Christmas Carolles" for the sake of convenience. The only title page indicated that it was, ‘imprynted at London, in the Powltry, by Richard Kele, dwelynge at the longe shop vnder saynt Myldrede’s Chyrche,’ probably ‘between 1546 and 1552.’ Antiquarian William Hone wrote in 1823: “I had an opportunity of perusing this exceedingly curious volume which is supposed to be unique, and has since passed into the hands of Mr. [Francis] Freeling.” Hone, Ancient Mysteries Described (1823), p. 102. Rev. Thomas Dibdin observed that "This singular volume may be classed among the very rarest books of early English poetry in existence; as only one copy of it is at present known , which is in the possession of the Rev.d H. Cotton, of Christ Church, Oxford." Dibdin, Typographical Antiquities. Vol. 4 of 4. (London: London: Longman, Hurse Rees, Orme, and Brown, 1819), pp. 304-305. No other copy has yet come to light. All the pages in the Kele collection were photographed and reproduced in Edward Bliss Reed's Christmas Carols Printed In The 16th Century, pp. 19-66, consisting of 48 plates. Reed's discussion of Kele's collection in the Introduction is on pages xl-lxiv. The pages in Kele's collection are in “black letter” Middle English, which the modern eye may find difficult to decipher. 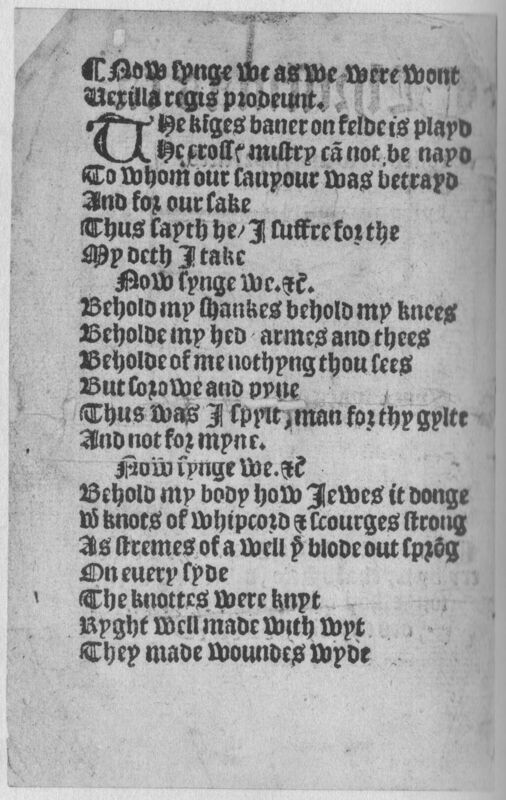 See right (The kignes banner, etc); also see Christmas Carols Printed In The 16th Century, which has all of these texts printed in the "Old Blackletter" font. Reed's book is online at Reed's Christmas Carols - 01 and Reed's Christmas Carols - 02. The original is from the University of Michigan. A PDF and OCR of the text is available, but only to "partner institutions." I'm not one. Based on prior experience, a letter to the Library or University requesting access as a private researcher, unaffiliated with any college or university, will either be ignored or the response will be "no." The page images can be downloaded, one at a time. 1. The first eight leaves, pages 1-16, is the first collection, published by Kele. 2. The second collection also contains eight leaves; it begins on p. 17 and concludes on p. 30. It is missing the first leaf, the title page. 3. The third collection consists of five leaves, in order, pp. 31-40. Again, it is missing the first leaf, the title page. 4. Next are two leaves, pp. 41-44, from one collection. 5. And in conclusion, there are two more leaves, pp. 45-48, also from one collection. In all, there are 48 pages in this group. There are 24 carols, some incomplete, and there are also 37 poems, for a total of 61 items. Links to carols may be to Kele's texts, although some links are to other collections. For the best display of some carols, it may be necessary to install either Old Blackletter or Junicode Fonts. Below the Alphabetical Listing there is a listing of the carols by collection. This index listing is from Edward Bliss Reed, ed., Christmas Carols Printed In The 16th Century (Cambridge: Harvard University Press, 1932), pp. 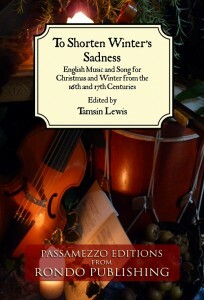 103-104, and includes only the carols in the Kele collection (other carols in Reed's book are discussed below). The first lines of the refrains are in italics; the first lines of the poems are in roman type. The references are to the facsimile reprints. Whan the aungell Aue began. Seven of these Christmas carols were reprinted by Philip Bliss in his 'Bibliographical Miscellanies' (Oxford, 1813), pp. 48-61. At that time, the volume was in the possession of Mr. Henry Cotton, of Christ Church College, Oxford. The copious extracts from this curious volume, as seen in the work just referred to, 'will give the reader a fair idea of the nature of these compositions, and the taste of the times in which they were collected for general dispersion.' These are doubtless very interesting; especially the two carols of O my heart is wo! and My hart of golde as true as stele; but an inspection of the volume itself will prove the good taste of the critic who gave these extracts, as he has judiciously omitted those portions of a very loose and extraordinary character, which were unaccountably meant to meet the eye of the pious purchaser. These carols were wholly unknown to [William] Herbert, [editor of the second edition of Typographical Antiquities]. Dibdin, Typographical Antiquities. Vol. 4 of 4. (1819), pp. 304. The seven carols that Bliss reproduced are listed below. In some cases, the first line of the verse, rather than the first line of the burden, is the title of the web page. The Christmas Carols, which are particularly curious, are extracted from a supposed unique copy or copies in the possession of Mr. [Henry] Cotton, Student at Christ Church, to whom the Editor is happy of making this public acknowledgment for his kindness. The earliest printed collection of Christmas Carols hitherto discovered is a leaf of a volume printed by Wynkyn de Worde in the year 1521. This leaf was accidentally picked up by the well-known antiquary Thomas Hearne, who inserted it in a volume of tracts that was purchased at Hearne's decease by Dr. Richard Rawlinson, of St. John's College, Oxford, who bequeathed it (with many others) to the Bodleian Library. The carols themselves should have been inserted in this place had they not been reprinted so lately; the first in Mr. Haslewood's edition of Juliana Berners' "Boke of St. Albans;" the second in Mr. Dibdin's "Typographical Antiquities." Inprinted at London, in the Powltry by Richard Kele, dwelling at the longe shop under saynt Myldredes Church. It is impossible to say whether the whole of this valuable relique to be of Kele's printing, since it is imperfect. For my own part I conceive it to be a part of at least three volumes of caroles as there are three different sets of signatures. The first wants probably only the colophon or last leaf, but the others are too imperfect to allow any reasonable conjecture as to their extent or contents. The following extracts will give the reader a fair idea of the nature of these compositions, and the taste of the times in which they were collected for general dispersion. Nor would he be less surprised at the manners of our ancestors, if delicacy did not restrain me from giving publicity to some of these curious songs, two of which contain the most gross and disgusting obscenity. It only remains to state that the volume or volumes were probably printed between 1546 and 1552, during which time Kele lived at the Long Shop in the Poultry, and at the sign of the Eagle near unto Stocks Market, in Lombard-street. Now synge we as we were want [The kiges baner on felde is playd; In Blackletter: The kiges baner on felde is playd], p. 48-51. O my hart is wo! [Whan that my swete sone; in Blackletter: Whan that my swete sone] p. 51-53. To increase our ioy and blysse [Make we mery in hall and boure; in Blackletter: Make we mery in hall and boure], p. 54-55, De Circumcisione Domini. Be we mery in this feste [In Betheleem, That Noble Place; in Blackletter: In Betheleem that noble place], p. 56, Christmas Eve, the Shepherds – S W H R.
Nowell, nowell, nowell, nowell [Lordes and ladyes all by dene; in Blackletter: Lordes and ladyes all by dene], p. 57 – S B R (Modern Spelling: A New Carol of Our Lady). Marke this songe for it is trewe; in Blackletter: Marke this songe for it is trewe, [There was one Octauyan], p. 58-61, A Carol of the Innocents – S H R.
There are multiple versions of most of these carols on this web site. Other collections of Christmas carols have included these seven and many of the other 54 songs and poems contained in the Kele collection. Most are not in Middle English, but are, instead, in contemporary language and font. See: Full Index Of The Hymns and Carols. In addition to Kele's carols, the volume by Edward Bliss Reed contained eight other carols that were printed in the 16th Century, including The bores heed in hande bring I; in "Old Blackletter:" The bores heed in hande bring I. This carol is on Plate "A." 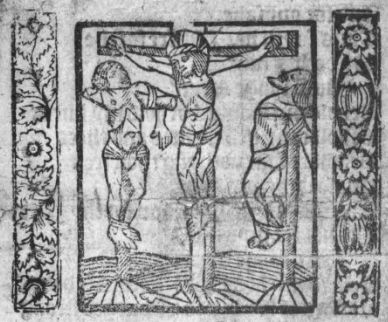 The printer was Wynkyn de Worde, Christmasse carolles newely enprinted (1521). The fragment is now in the Bodleian Library, Rawlinson 4to. 598(10). The remaining carols are found on Plates G through N. They are all from a single collection, Christmas carolles newely Imprinted, previously in the possession of Mr. Francis Douce (1757-1834) (Douce fragments f. 48, now in the Bodleian Library, Oxford). The printer and date are unknown. Some pages are missing with the result that some carols are missing verses. Songs and Carols from a Manuscript in the British Museum of the Fifteenth Century (The Warton Club, 1856, from the Sloane Manuscript No. 2593, now in the British Museum). Twenty carols from the Sloane manuscript were previously published by Wright, Songs and Carols Printed From A Manuscript in the Sloane Collection in the British Museum (London: William Pickering, 1836). He had also edited Specimens of Old Christmas Carols Selected from Manuscripts and Printed Books (The Percy Society, 1841). This information was extracted from a number of sources, believed to be accurate. No guarantees, however, can be made. 1546 and 1552. Printed by Richard Kele (Collection I). It is unknown when the parts of four other collections were printed and added. Circa 1650, Roger Morrice acquired the pamphlet. Jan. 17, 1701. Date of death of Rev. Roger Morrice, age 71. His name is written on the title page. He matriculated at Magdalen Hall, Oxford, Feb. 22, 1650-1. Chaplain to Denzil, Lord Hollis until he was ejected, 1662. Died at Hoxton, Middlesex, Jan. 17, 1701-2. He left a large collection of manuscripts and books, which was sold after his death. 1701- Oct. 15, 1733. (start date approximate). Owned by Samuel Marriott who on Oct. 15, 1733, wrote a notice of ownership that was pasted in the book indicating that he had owned and preserved this book for "for about or near to 30 Years." Nothing is known about Mr. Marriott. 1813. Owned by Mr. Cotton, student at Christ Church, and loaned to Philip Bliss who transcribed seven carols in his book "Bibliographical Miscellanies" (1813). Rev. Henry Cotton (1789–1879), Christ Church, Oxford, B.A. (1811), M.A. (1813), D.C.L. and admitted into holy orders (1820). He authored a dozen or so books. The Dictionary of National Biography, 1885-1900, Volume 12, noted "All his writings ... are highly creditable to his scholarship, while his ‘Fasti Ecclesiæ Hibernicæ’ (5 vols. 1851–1860) is a standing monument of the most patient industry. It has done for the Irish church what Hardy's ‘Le Neve’ has done for the English; in fact, it excels its English rival...." He retired after losing his eyesight in 1872, died at his residence in Lismore 3 Dec. 1879, and was buried in the graveyard of Lismore Cathedral. 1819. Rev. H. Cotton, Christ Church, Oxford, still had possession when Dibdin wrote his notes. Between 1819 and 1823. Sold to Sir Francis Freeling (1764-1836) of London. William Hone, in his Ancient Mysteries Described (1823), wrote "I had an opportunity of perusing this exceedingly curious volume, which is supposed to be unique, and has since passed into the hands of Mr. Freeling." William Sandys in 1833 also reports that the volume is now in the hands of Sir Francis Freeling. Nov. 25, 1836. Purchased for £25 by Thomas Thorpe, the agent and librarian of William Henry Miller, founder of the Britwell Court library. March 31, 1924. At the dispersal of the Britwell Court Library, it was sold to the Huntington Library, San Marino, California. 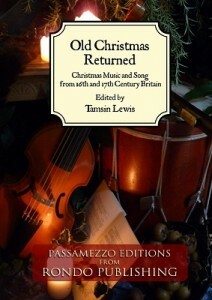 English musician, composer and scholar, Tamsin Lewis, has created two delicious collections of English music and song from the 16th and 17th Centuries for Christmas and Winter. From Advent through Candlemas, these books contain a selection of carols, hymns and ballads that celebrate both the birth of Christ, as well as the festivities of the Christmas-tide.